Exciting western historical stories,novels, and articles. What woman wouldn't love a Cowboy Kiss? 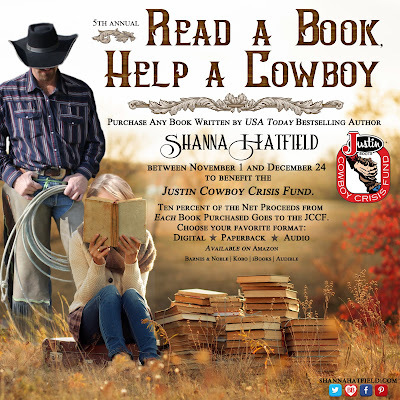 For the past five years, I’ve been seeking to help rodeo athletes who need a hand up. 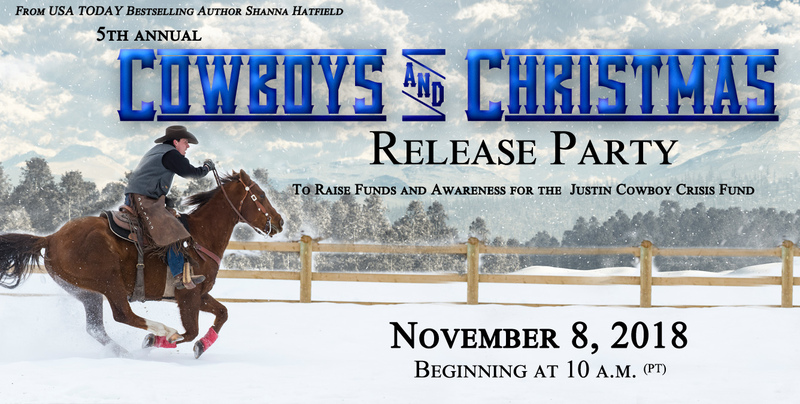 November 1 through December 24, ten percent of the net proceeds from all my book sales will be donated to the Justin Cowboy Crisis Fund. The JCCF is a non-profit organization that assists rodeo athletes who’ve sustained catastrophic injuries and are unable to work for an extended period. To kick start this year's campaign, I'm throwing a party! I hope you'll join me, along with 12 guest authors for four hours of fun, games, giveaways, and surprise announcements! The fun begins at 10 a.m. Pacific Time (11 MT, Noon CT, 1 p.m. ET). I'll also be celebrating the release of the next book in the Rodeo Romance series. Brylee Barton has just one goal in mind: win the barrel racing world championship. Not for the glory, but for the attached cash prize that could save her family’s ranch. When an injury leaves her at the mercy of the very same copper-headed, silver-tongued cowboy she once vowed to loathe forever, she has no choice but to swallow her pride and accept his help. Fun-loving, easy-going Shaun Price has a million dollar smile, more charm than he can channel, and a string of ex-girlfriends rumored to have started their own support group. When the one woman he’s never quite managed to get out of his head or heart needs his assistance, he jumps at the chance to help. Little does he realize how challenging it will be to keep from falling for her all over again. With the holiday season fast approaching, will Shaun and Brylee discover the gift of forgiveness, and experience their own happily-ever-after? This sweet Christmas romance warms the heart, lifts the spirit, and touches the soul with its message of forgiveness, hope, and redemption. Don’t miss it! Brylee opened her eyes and tipped her head back, watching as the pickup men rode into the arena. One went to catch Rocket while the other hastened her direction. The announcer and the clown told a joke as the medical team hustled toward her as fast as they could make it through the mud. Frustration battled with anger as the pickup man approached. The last person on earth she wanted to see was that man. “Maybe today would be a good day to die,” she muttered as she tried again to move her foot from beneath the fence. If she freed it before he reached her, she could crawl over the fence and make her way back to her trailer without speaking to him. Why couldn’t he have gone on ignoring her like he had the last five and half years? Why tonight, of all nights, was he going to force her to acknowledge him? Didn’t she have enough to deal with, like missing her opportunity to claim the winning title? Or the undeniable fact she looked like a half-drowned kitten that had been dragged through a pig wallow? She thought of her wasted entry fee. Not to mention the hours it would take to get all the mud scrubbed off Rocket and her tack. Wasn’t a no-score enough punishment without being forced to face the most arrogant, self-centered, childish man she’d ever known? Trapped on her back in the mud, it seeped through her clothes, chilling her and making her fight the need to shiver. She questioned how she could exit the arena with even a shred of dignity when her pants oozed soupy mud like a toddler’s soggy diaper. The slap of boots hitting the mud in the arena drew her gaze upward. A handsome face appeared above her as the pickup man leaned over her. Gray-blue eyes twinkled behind thick lashes and a smile full of even, white teeth gleamed in the arena lights. Shaun Price braced his gloved hands on his thighs and offered her an infuriatingly cocky grin. Why couldn’t she have at least passed out and awakened far away from the infuriating, irritating, Adonis-like cowboy? “Well, Bitsy, I see you’re still racing Christmas,” he said, his voice sounding as deep and rich as she remembered. Brylee glowered at him. “You know I hate that name." “Yep, I sure do.” Shaun chuckled and stepped back as the medics surrounded her. 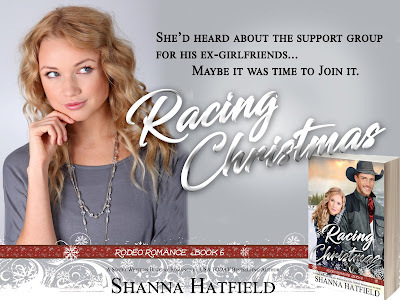 USA Today bestselling author Shanna Hatfield is a farm girl who loves to write. Her sweet historical and contemporary romances are filled with sarcasm, humor, hope, and hunky heroes. When Shanna isn’t dreaming up dreamy characters, twisting plots, or covertly hiding decadent chocolate from the other occupants of her home, she hangs out with her beloved husband, Captain Cavedweller. Shanna loves to hear from readers. 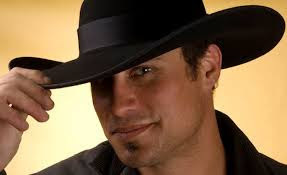 We are a group of western romance authors and often use images found on Google or elsewhere. We strive to use attributes pertaining to the western and romance genres but don't always succeed. If you find something on our site that makes you uncomfortable, please contact me at julie@julielence.com and I'll make sure the artwork is promptly removed. We have a proposed schedule and hope you'll participate. Click on the image above for information and come be part of the fun. Handkerchief, Wild Rag, Bandana? Just What Is That Thing Around Your Neck? Meg Mims -- Down and Dirty in the Old West: What's a Woman to Do? ATTENTION WESTERN ROMANCE AUTHORS: If you know one of the participants and want to be their guest, then email them directly and they can set you up. OR...You can also email me at julie@julielence.com and I can find a slot for you. Please put "Cowboy Kisses Guest Author Request" in the subject line. Thank you! 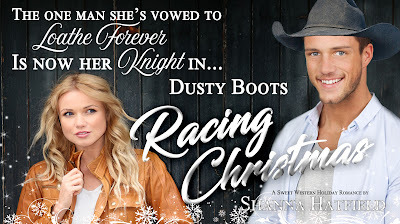 How would you like a cowboy at Christmas?